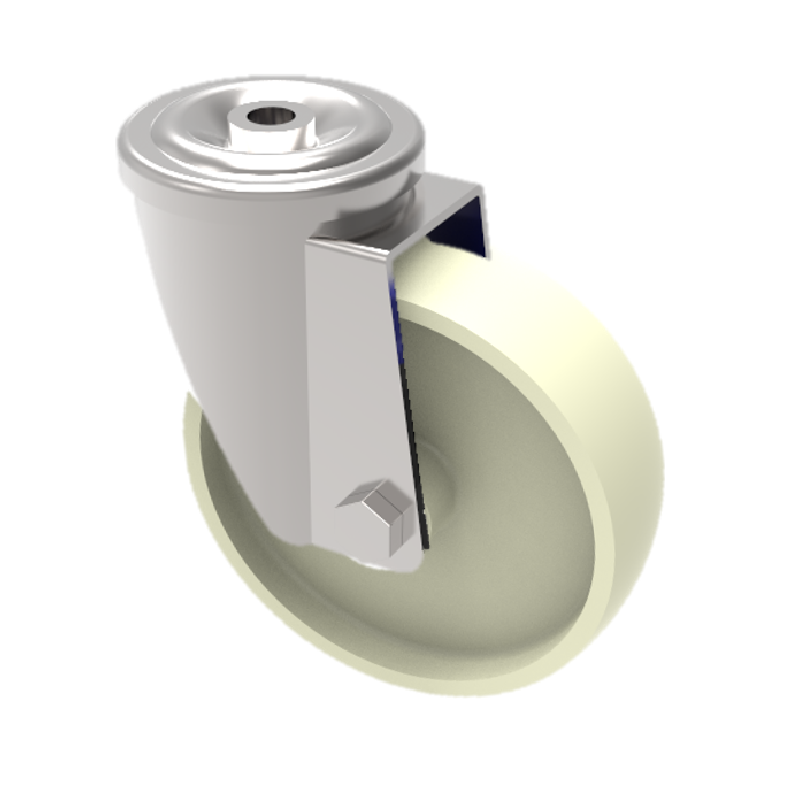 9 different wheel options are available. Load ranges from 150kg up to 230kg per castor. Pressed steel fixed castor with a top plate fixing fitted with a black Ditherm wheel with a plain bearing. Wheel diameter 80mm, tread width 35mm, overall height 113mm top plate 100mm x 85mm, hole centres 80mm x 60mm or 75mm x 45mm. Load capacity 150kg. Max temp 300oC. REACH compliant, RoHs Compliant, USDA approved FDA approved. Pressed steel swivel castor with a 12mm bolt hole fixing fitted with a High Temp nylon wheel with a plain bearing suitable up to 130 DegreeC. 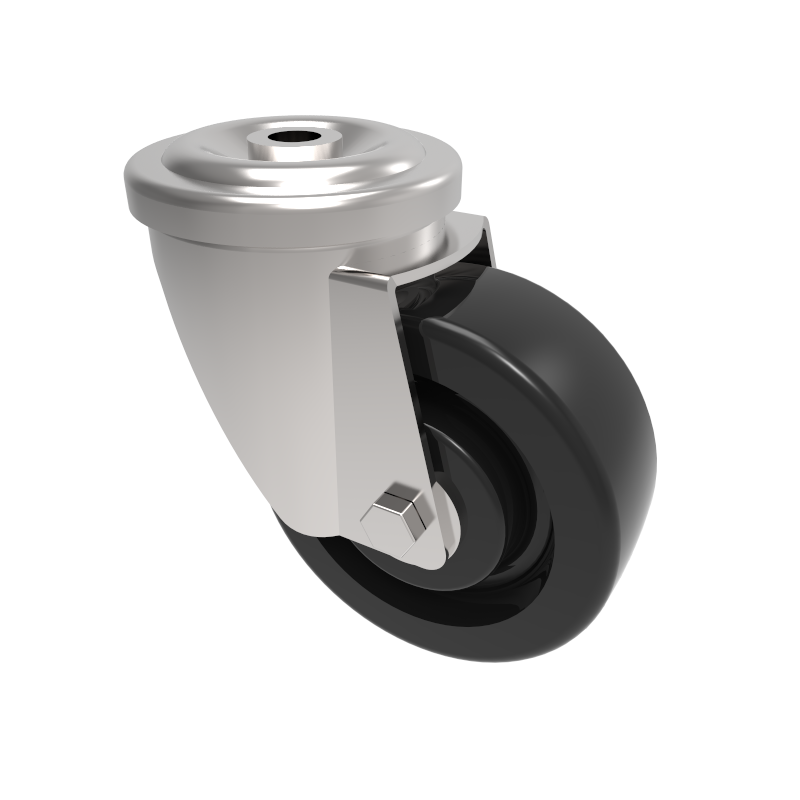 Wheel diameter 80mm, tread width 35mm, overall height 110mm. Load capacity 190kg. 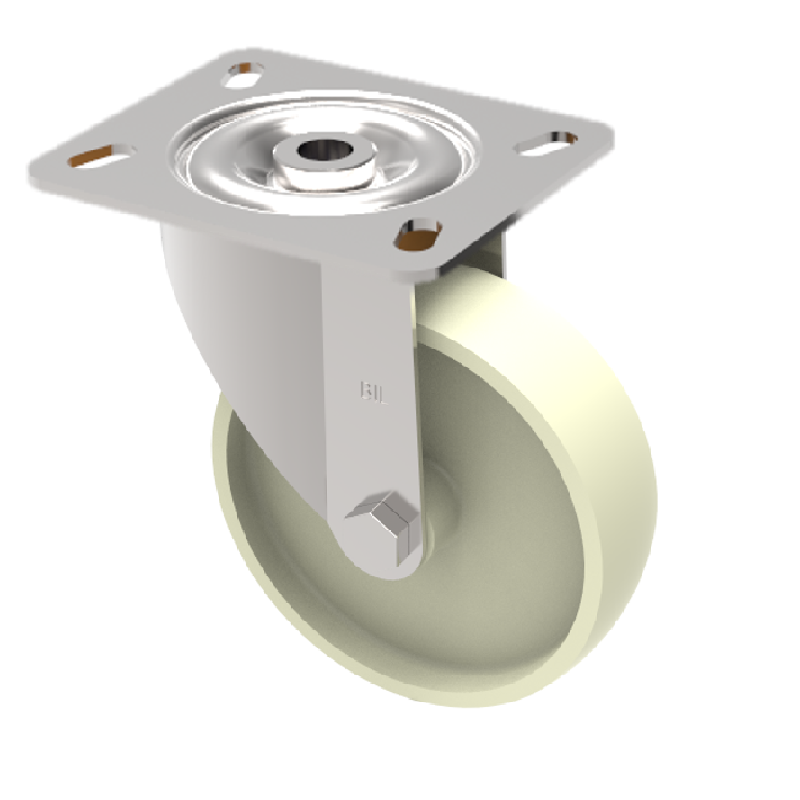 Pressed steel swivel castor with a top plate fixing fitted with a off white nylon wheel with a plain bearing. 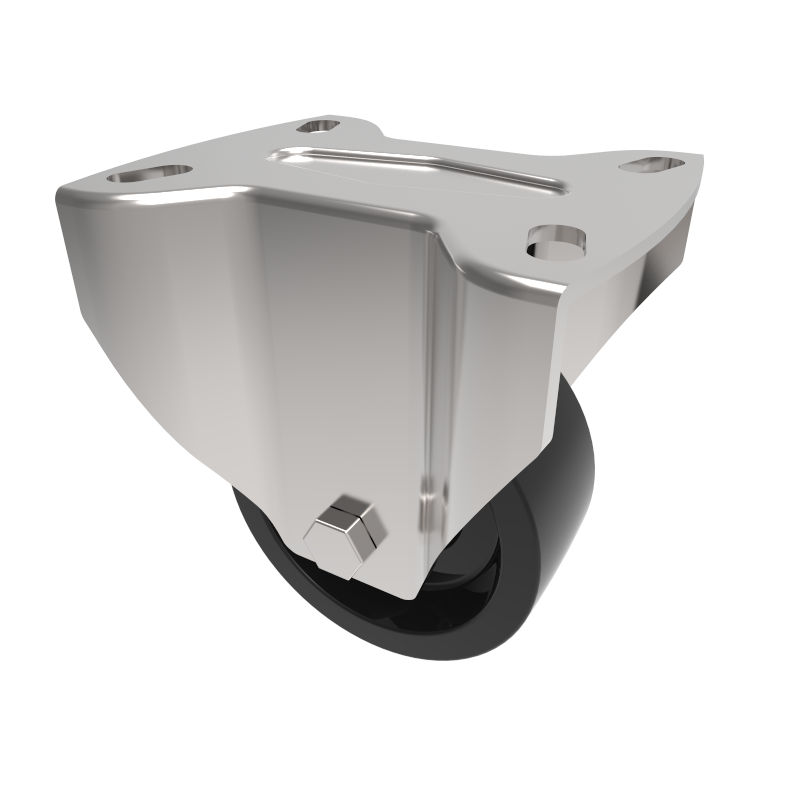 Wheel diameter 80mm, tread width 35mm, overall height 133mm, top plate 100mm x 85mm, hole centres 80mm x 60mm or 75mm x 45mm. Load capacity 210kg. 150C max temp. Pressed steel fixed castor with a top plate fixing fitted with a off white nylon wheel with a plain bearing . 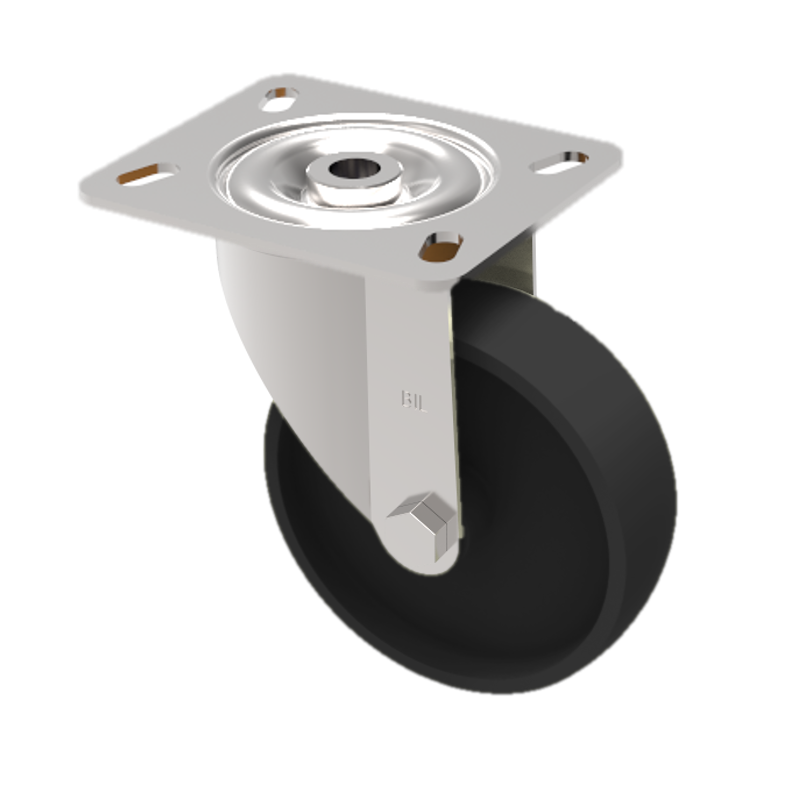 Wheel diameter 100mm, tread width 40mm, overall height 130mm, top plate 100mm x 85mm, hole centres 80mm x 60mm or 75mm x 45mm. Load capacity 210kg at a maximum 150c. Pressed steel fixed castor with a top plate fixing fitted with a black phenolic wheel. Wheel diameter 100mm, tread width 38mm, overall height 133mm, plate size 100mm x 85mm, hole centres 80mm x 60mm or 75mm x 45mm. Load capacity 180kg with a maximum temperature of 120c. Pressed steel fixed castor with a top plate fixing fitted with a off white nylon wheel with a plain bearing. Wheel diameter 100mm, tread width 40mm, overall height 133mm, top plate 100mm x 85mm, hole centres 80mm x 60mm or 75mm x 45mm. Load capacity 230kg. 150C max temp. Pressed steel fixed castor with a top plate fixing fitted with a black Ditherm wheel. Wheel diameter 100mm, tread width 35mm, overall height 133mm, plate size 100mm x 85mm, hole centres 80mm x 60mm or 75mm x 45mm. Load capacity 160kg with a maximum temperature of 300c.REACH compliant, RoHs Compliant, USDA approved FDA approved. Pressed steel swivel castor with a top plate fixing fitted with a top plate fixing fitted with a black Ditherm wheel 300oC with a plain bearing. Wheel diameter 100mm, tread width 35mm, overall height 130mm, top plate 100mm x 85mm, hole centres 80mm x 60mm. Load capacity 180kg. REACH compliant, RoHs Compliant, USDA approved FDA approved. 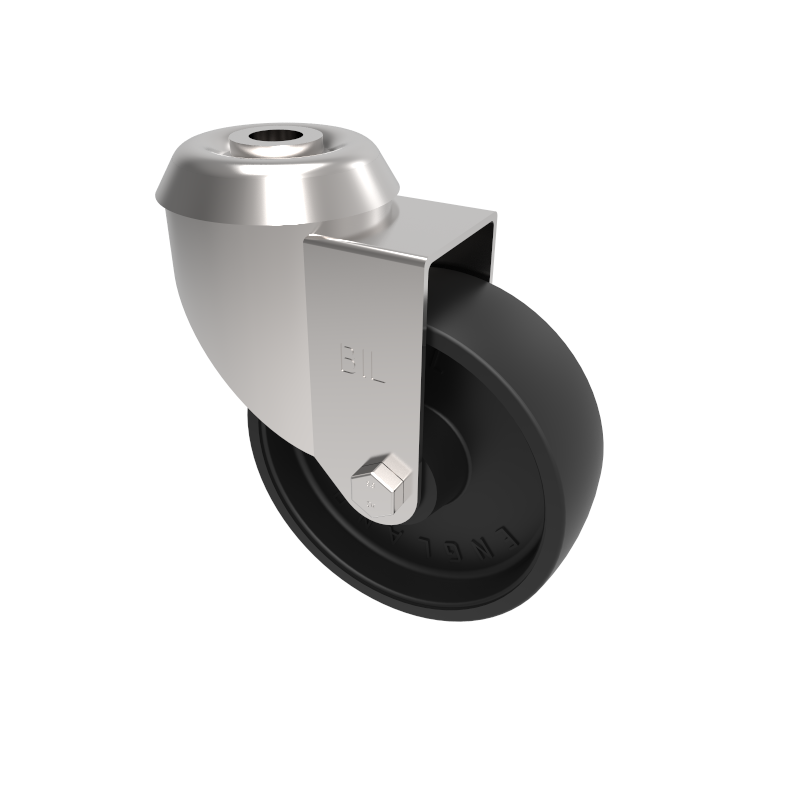 Pressed steel swivel castor with a 12mm bolt hole fitted with a phenolic wheel with a plain bore. 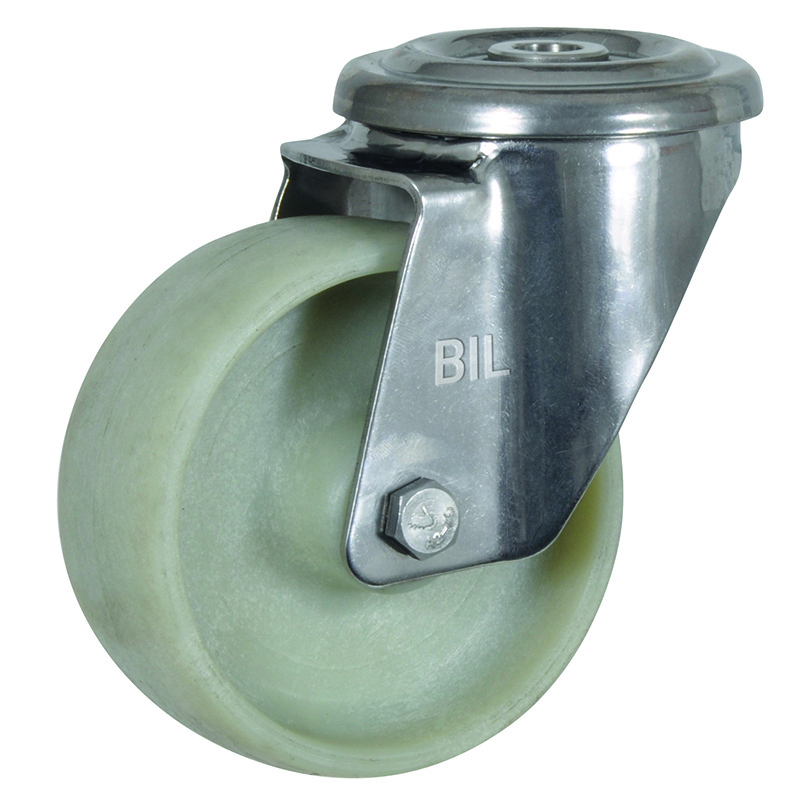 Wheel diameter 100mm, tread width 38mm, overall height 133mm, Load capacity 180kg with a maximum temperature of 120c.. Pressed steel swivel castor with a 12mm bolt hole fitted with a brown phenolic wheel. 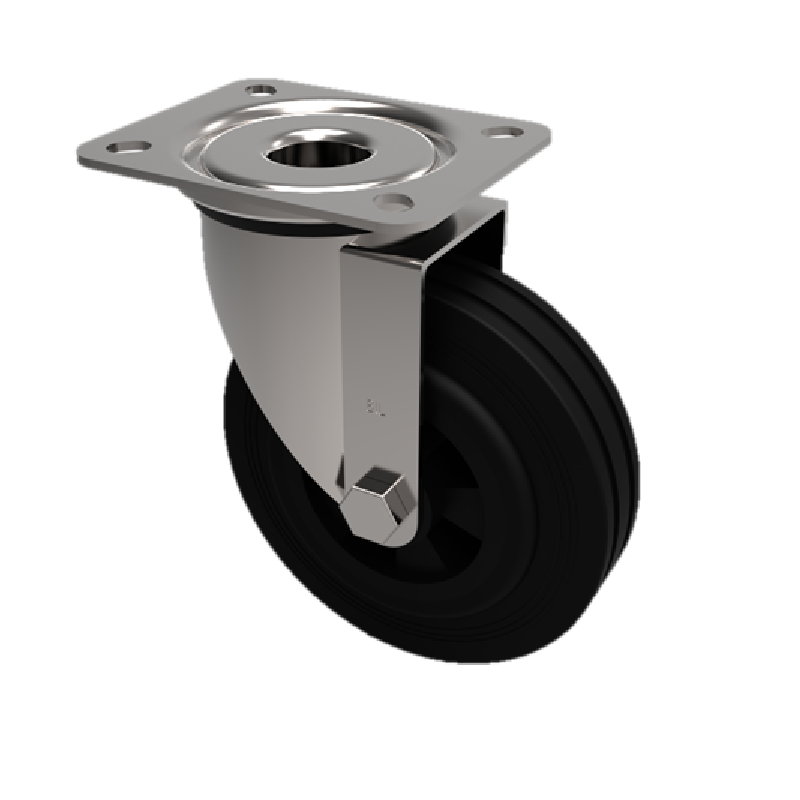 Wheel diameter 100mm, tread width 38mm, overall height 133mm, Load capacity 180kg with a maximum temperature of 250c.. Pressed steel fixed castor with a top plate fixing fitted with a black Ditherm wheel with PTFE bushes. 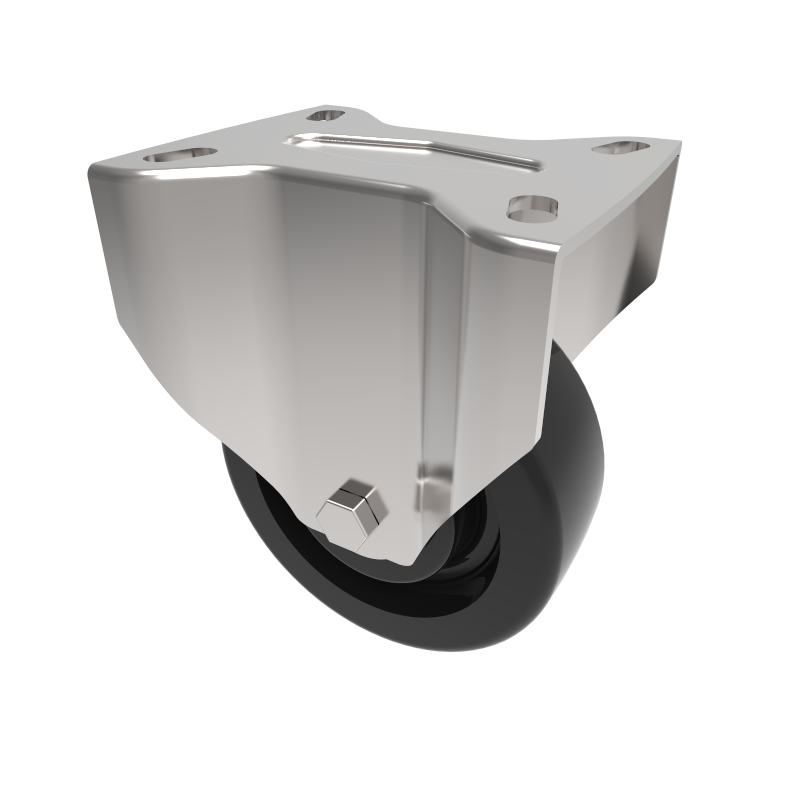 Wheel diameter 80mm, tread width 35mm, overall height 113mm, top plate 100mm x 85mm, hole centres 80mm x 60mm. Load capacity 150kg. Temp range 300oC. REACH compliant, RoHs Compliant, USDA approved FDA approved. Pressed steel fixed castor with a top plate fixing fitted with a black Ditherm wheel. Wheel diameter 100mm, tread width 35mm, overall height 133mm, plate size 100mm x 85mm, hole centres 80mm x 60mm or 75mm x 45mm. Load capacity 180kg with a maximum temperature of 300c. REACH compliant, RoHs Compliant, USDA approved FDA approved. 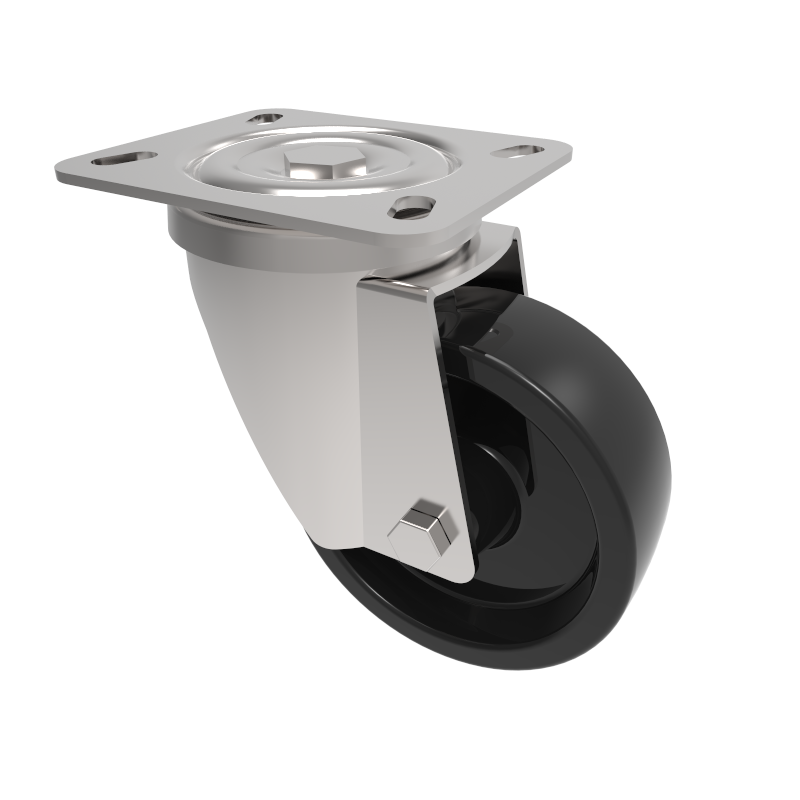 Pressed steel swivel castor with a top plate fixing fitted with a black phenolic wheel. Wheel diameter 100mm, tread width 38mm, overall height 133mm, plate size 100mm x 85mm, hole centres 80mm x 60mm or 75mm x 45mm. Load capacity 180kg with a maximum temperature of 120c. Pressed steel fixed castor with a top plate fixing fitted with a high temperature Ditherm wheel with a stainless steel PTFE coated bush. Wheel diameter 100mm, tread width 35mm, overall height 130mm, top plate 100mm x 85mm, hole centres 80mm x 60mm or 75mm x 45mm. Load capacity 160kg. Max temp 300oC. REACH compliant, RoHs Compliant, USDA approved FDA approved. 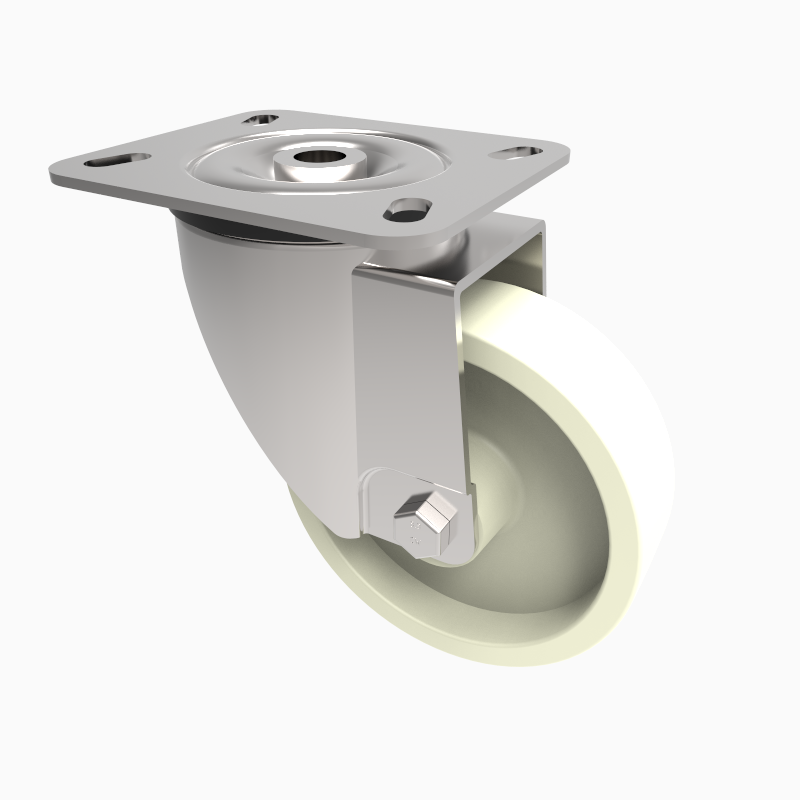 Pressed steel swivel castor with a top plate fixing fitted with a off white nylon wheel with a plain bearing . Wheel diameter 100mm, tread width 40mm, overall height 130mm, top plate 100mm x 85mm, hole centres 80mm x 60mm or 75mm x 45mm. Load capacity 210kg at a maximum 150c. Pressed steel swivel castor with a top plate fixing fitted with a black Ditherm wheel with a plain bearing. Wheel diameter 80mm, tread width 35mm, overall height 113mm top plate 100mm x 85mm, hole centres 80mm x 60mm or 75mm x 45mm. Load capacity 150kg. Max temp 300oC. REACH compliant, RoHs Compliant, USDA approved FDA approved. Pressed steel fixed castor with a top plate fixing fitted with a black high temp Ditherm wheel with PTFE bushes. 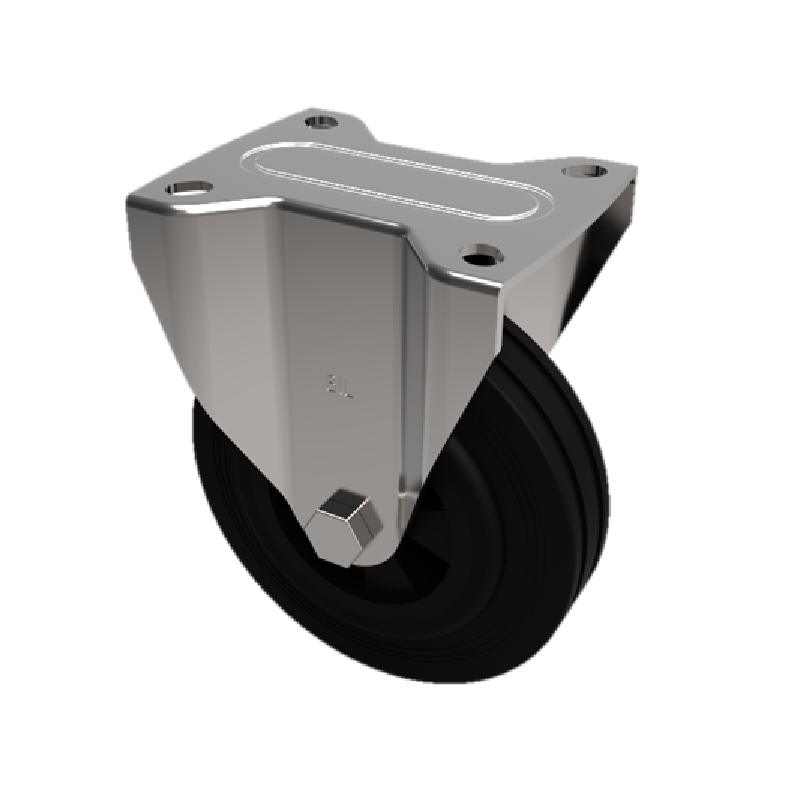 Wheel diameter 100mm, tread width 35mm, overall height 130mm, top plate 100mm, x 85mm. hole centres 80mm x 60mm or 75mm x 45mm. 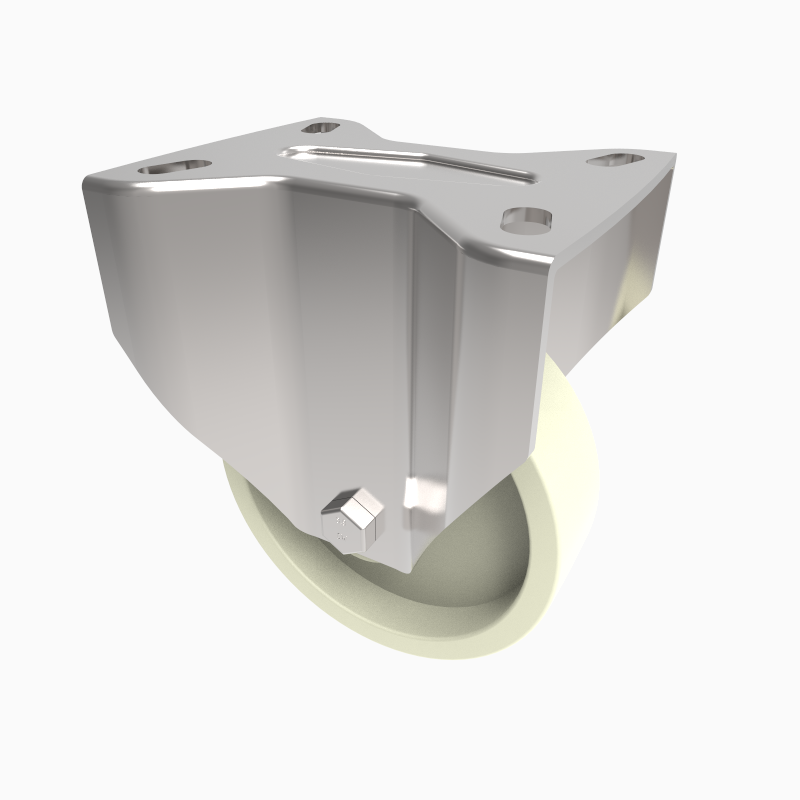 Load capacity 150kg at 300 C. REACH compliant, RoHs Compliant, USDA approved FDA approved. 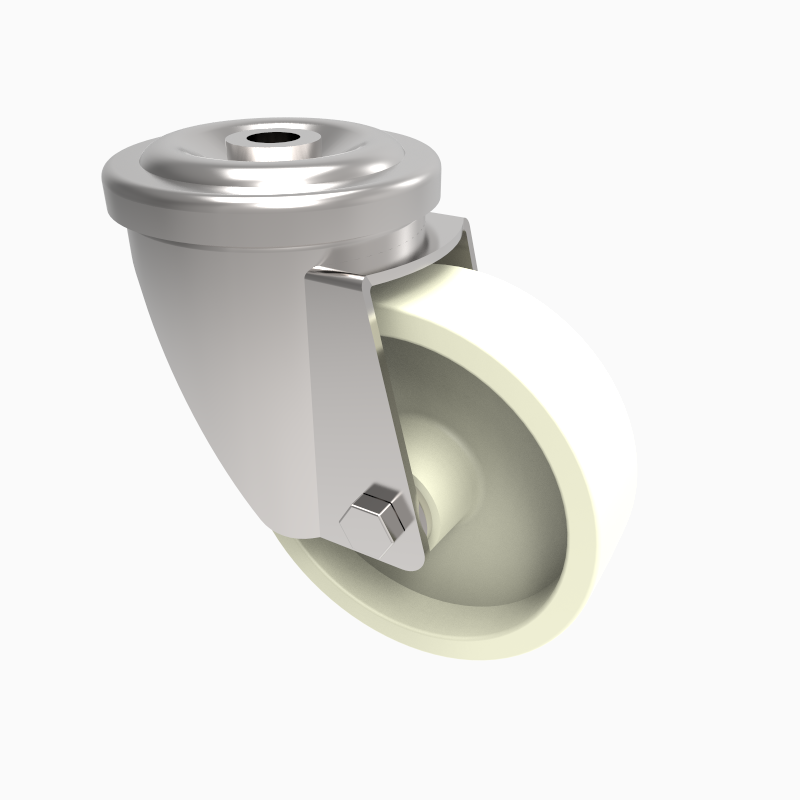 Pressed steel swivel castor with a 12mm bolt hole fitted with a high temp off white nylon wheel with plain bearing. 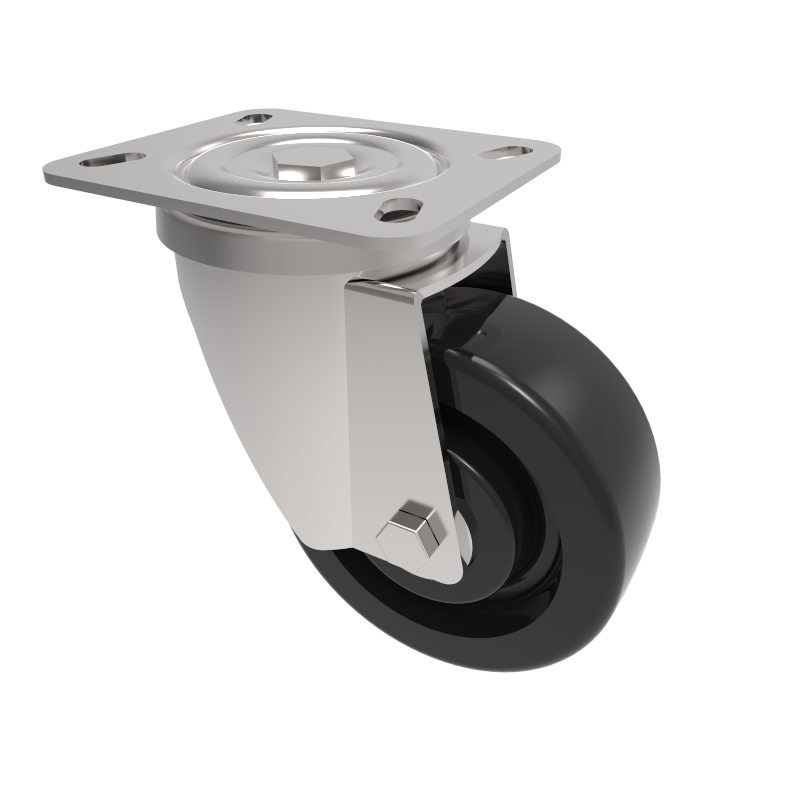 Wheel diameter 100mm, tread width 40mm, overall height 130mm, Load capacity 200kg at a maximum 150 c.
Pressed steel swivel castor with a top plate fixing fitted with a off white nylon wheel with a plain bearing. Wheel diameter 100mm, tread width 40mm, overall height 133mm, top plate 100mm x 85mm, hole centres 80mm x 60mm or 75mm x 45mm. Load capacity 230kg. 150C max temp. Pressed steel swivel castor with a top plate fixing fitted with a black Ditherm wheel. Wheel diameter 100mm, tread width 35mm, overall height 133mm, plate size 100mm x 85mm, hole centres 80mm x 60mm or 75mm x 45mm. Load capacity 160kg with a maximum temperature of 300c. REACH compliant, RoHs Compliant, USDA approved FDA approved. Pressed steel fixed castor with a top plate fixing fitted with a 300oC black thermoplastic wheel with a plain bore. Wheel diameter 100mm, tread width 35mm, overall height 133mm, top plate 100mm x 85mm, hole centres 80mm x 60mm ore 75mm x 45mm. Load capacity 200kg at 300c. Pressed steel swivel castor with a top plate fixing fitted with a black Ditherm wheel with a plain bore. Wheel diameter 100mm, tread width 35mm, overall height 130mm, top plate 100mm x 85mm, hole centres 80mm x 60mm or 75mm x 45mm. Load capacity 180kg at a maximum temperature of 300c. REACH compliant, RoHs Compliant, USDA approved FDA approved. Pressed steel fixed castor with a top plate fixing fitted with a high temperature Ditherm wheel with a stainless steel PTFE coated bush. Wheel diameter 100mm, tread width 35mm, overall height 130mm, top plate 100mm x 85mm, hole centres 80mm x 60mm or 75mm x 45mm. Load capacity 180kg. Max temp 300oC. REACH compliant, RoHs Compliant, USDA approved FDA approved.